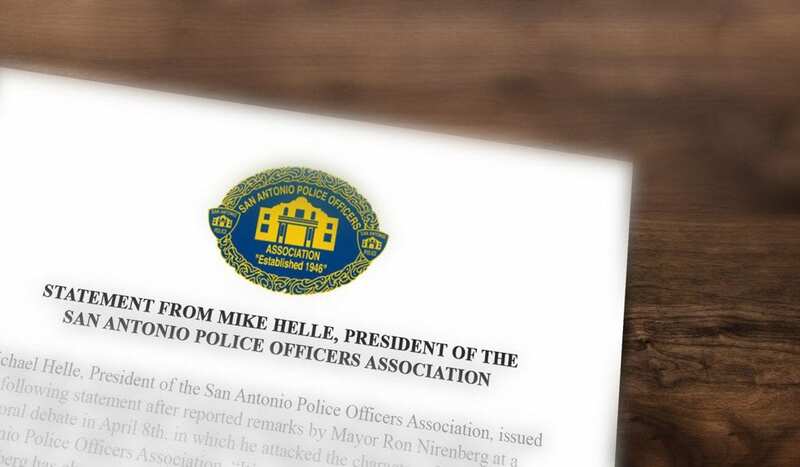 Michael Helle, President of the San Antonio Police Officers Association, issued the following statement after reported remarks by Mayor Ron Nirenberg at a mayoral debate on April 8th, in which he attacked the character of the San Antonio Police Officers Association. The Mayor, Ron, doesn’t like to obey the laws. He voted to deliberately violate a Federal law and discriminated against Chik filet for their religious beliefs. He is also about a “sanctuary city” which is harboring illegal aliens. I live in Converse, but I have worked with several SAPD officers. Obviously San Antonio’s mayor has no clue as to what any police officer does on a daily basis. They out their lives on the line each and every day. They have no idea who or what they will encounter on any call they are dispatched to. Perhaps if the mayor rode with various officers in different areas of San Antonio, he would see what these officers do. If I lived in SA, I certainly wouldn’t vote for the mayor for another term. What about the detectives and administrators that don’t work in the field. Do they actually work? Sapd officers take pride in their line of duty. They assess dangerous situations and keep them private for security purposes…as a resident of sanantonio the association is accredited through the city and their families. They take pride in their jurisdiction and shouldn’t be taken for granted. The crime rate in San Antonio is unacceptable as we do no have enough manpower to suffice the downtown area or crisis intervention they should be honored for their duty..chief and all who work with him. I support SAPOA. He never had or will ever have my vote. He needs to leave the office and never come back. Glad Scully is out. Also I hope Chuck-fil-A kicks their but. I support them also. That is pure discrimination. We need to vote to get tbis mayor along with his corrupt,destructive and anti_Christian agenda. Personally, I respect and appreciate Law Enforcement for all they do. The Mayor lacks integrity and falls short in so many areas that a leader should not. This guy must be voted out, I’m sorry to say but I also believe McManus must also go with Sculley who is already gone. These 3 were never up to any good. Never had the back real officer’s, or ICE. Go get them Helle. I couldn’t agree with you more Mike, Keep up the fight, The fact that this Mayor seems to think that barring Chick-fil-a, the largest income generator at the Airport food court, in the guise of being inclusive is utter nonsense. Chick-fil-a does more for the San Antonio community than this mayor ever has done. He does not represent the ideas of the citizens of San Antonio. Thank you Mike for supporting your members from Ron Nirenberg attacks. I have been an advocate for the taxicab industry 39 years. We too have been attacked by Ron Nirenberg and he needs to go! A couple of years ago Ron Nirenberg, and many on the city council supported and approved Uber/Lyft two out of town corporations and their No regulation demands. Ron and Scully supported Uber and Lyft drivers working in our city WITHOUT fingerprint criminal background checks. This after they were told women all over the world were being sexually assaulted and raped by their unvetted drivers. Ron Nirenberg compromised public safety of our citizens to accommodate these two multi billion dollar corporations. Yes, glad Scully is gone but Chief should have gone with her. He’s more interested in politics, making this a sanctuary city and the racial composition of the police department to run the PD properly. I’ve never heard anything good about the Mayor but I do follow world news mostly. So if I have made a complaint about the PD’s departmental deficiencies, specifically one detective and two departments, what are the chances of getting anywhere with my complaint? I keep hearing about a lot of corruption in the city, so who do you trust?